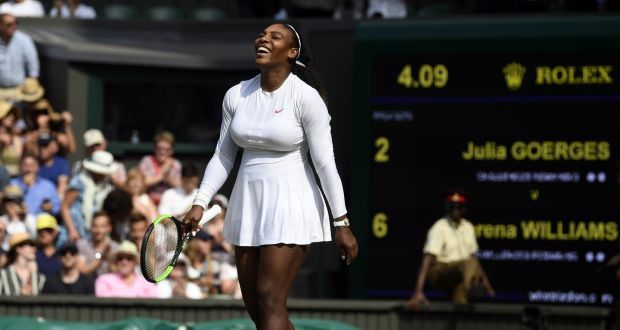 Serena Williams is set for what could be a record-tying 24 Grand Slam title as she reaches the Wimbledon Final.Serena set up a showdown with Angelique Kerber on Saturday after defeating Julia Görges in straight sets: 6-2 6-4. It’s crazy. I don’t even know how to feel because I literally didn’t think I’d do this well in my fourth tournament back.I don’t have anything to lose and I feel I can play so free. That’s what I’m doing.This is not inevitable for me, I had a really tough delivery and multiple surgeries and almost didn’t make it to be honest. I couldn’t even walk to my mailbox, so it’s definitely not normal for me to be in a Wimbledon final.